Common Causes of Stucco Paint Failure | Adriatic Restoration Corp.
Stucco creates a textured surface that’s timelessly attractive. But unlike with other materials, stucco painting involves a lot of know-how to avoid an unsightly mess. Are you at risk for a stucco paint disaster? Here are some common pitfalls. 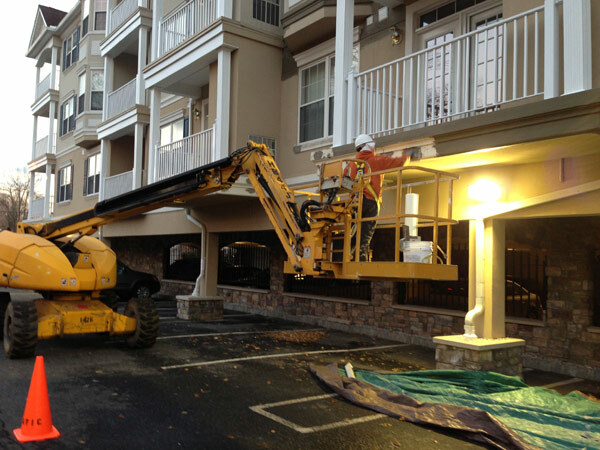 Stucco takes time to cure, but many business owners think they can fast-forward the wait and skip to painting. Painting over stucco that hasn’t properly cured or even needs exterior stucco repair can result in unsightly cracks. This is another instance where a lack of patience can lead to a bad stucco painting job. Something as simple as wanting to avoid taking scaffolding down can cause a contractor to apply stucco and paint over it too quickly. Paint will not adhere properly to uncured stucco and the result will be a chalky, dusty look. Stucco requires unique paints for adhesion. Paint that is not designed for use on stucco or is paired with the wrong primer can result in peeling and other ugly developments over time. There are lots of great reasons to choose stucco. But when painting, it’s crucial that you follow the proper procedures. Partner with experts in stucco painting to ensure a finish you can enjoy.